A Democratic senator said that with Brett Kavanaugh now on the Supreme Court she expects the court to chip away at the right to abortion rather thandirectly overturn the 1973 Roe v. Wade ruling. Hirono said she opposed the elevation of Kavanaugh to the Supreme Court before his confirmation hearings due to his judicial record, including on reproductive rights. 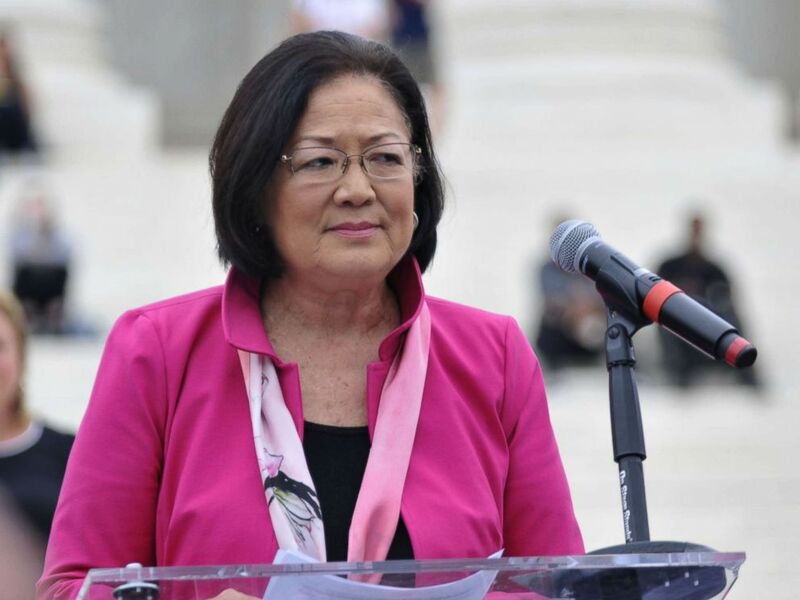 “I actually studied his cases, and I read his, particularly his dissents, which are very telling, very much against reproductive choice,” Hirono said. Sen. Mazie Hirono (D-HI) speaks to demonstrators gathered at the steps of the Supreme Court ahead of the expected confirmation of Judge Brett Kavanaugh, Oct. 6, 2018. “Of course it matters if [justices] go over there and actually overturn Roe v. Wade, which I doubt they’re going to do,” the Hawaii senator said. She went on to suggest that the court is more likely to greatly weaken the right to abortion by allowing more state restrictions on it. “The states are very busy passing all kinds of laws that would limit a woman’s right to choose,” Hirono said. “It’s those things that will go before” the justices. Kavanaugh was sworn in as a Supreme Court justice late Saturday after a tense 50-to-48 vote in the Senate that was repeatedly interrupted by protesters shouting in the gallery against senators voting to confirm him. His nomination had been rocked by sexual misconduct allegations against him from high school and college. Christine Blasey Ford alleged he sexually assaulted her at a small house party when they were both teens in high school. A former Yale University classmate of Kavanaugh’s alleged he exposed himself to her at a college party where there was drinking. Kavanaugh strongly and categorically denied all accusations of sexual misconduct. Karl asked if she approved of tactics by protesters against the Kavanaugh confirmation, some of whom confronted senators in hallways or elevators on Capitol Hill, called out to senators during the confirmation vote, and demonstrated on the Capitol rotunda’s steps. More than 150 people were arrested for unlawful demonstrations Saturday, Capitol Police said.